1. It’s a lung cheese kind of morning. First, I would like to say, “You’re welcome,” for that fantastic mental imagery that is making your cheese danish look unsavory, but it does truly describe how sick I am today. I think mine sounds prettier. I’d rather look at cheese than butter. 2. Two Random n’ats in a row here because 1. I’m sick and 2. It’s my blog and if I wanted I could post 40 Random n’ats in a row and watch my readership trickle away and 3. remember how I used to call these posts Random n@s and the guy who owns the trademark on n@ emailed me to ask me to stop? LOL. 3. If you do remember that, you have been reading me for a LONG time. Hugs. Where did I go. I think the DayQuil/NyQuil/Shiraz combination is wreaking havoc on my brain. Last night while we were watching Sunday Night Football, an Eat n’ Park commercial came on and I was all, “BLOOP BLOOP BLOOP!” But as I was blooping, I saw a familiar face! I also ran into Gina at the Women and Girl’s Foundation Women in Media Gala where she was supporting Miss Pennsylvania Teen USA 2010 Elena LaQuatra, who is also a sweetheart. 5. The Patriots got spanked by the Browns. I bet I never write that sentence again as long as I live unless I’m talking about Madden 2012 or some weird football-themed fetish flick. 6. Speaking of the Patriots, the Pittsburgh Rugby Football Club is raffling off a pair of tickets to the Steelers/Patriots game to help cover the costs associated with the team’s trip to Nationals. 7. I bought my husband a vintage-type Joe Greene Steelers jersey for his birthday last month and as I look at it, I much prefer the old block numbers to the slick jersey numbers we have now. They should go back to that. 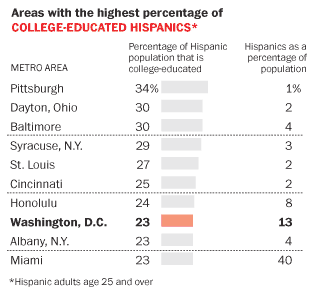 We have the highest percentage of college-educated Hispanics but the lowest percentage of Hispanics as a population. Pittsburgh’s economic growth would be so much more robust if we had a higher immigrant population, so I’d love to see that 1% figure inch up a bit. 9. If you’re looking for a place to put your charitable holiday dollars this year, consider throwing some of them toward Burgh Baby’s Christmas Crazy fund! FOR THE KIDS. @4. Saw the Eat n Park ads with ijustine2.0 and thought it was a relation to Sonni Abatta. @1. You are both very sick puppies. Thank you for that. @2. I sure remember Random n@ and I still think you should have told that guy to go pound sand. I’d chip in for your defense fund. @4. Unless they come on during Pens games (which I get via Center Ice) I miss all the good Pittsburgh commercials. I don’t recall seeing the Eat’n Park one, but I AM subjected to the 90-20 guys, which usually prompt me to stick a pencil in my ear. Hey, are they going to do a new Pens-related A&L Motors commercial? Or have I just missed it? I also remember Random N@. Is that guy trying to follow in the footsteps of Eat ‘n Park? I mean, I can see doing it to the company I work for because we were making money off of it. But you? Come on, dude. I was here for the n@ days!!! Even pre-n@ days! If memory serves me, there used to be a group that petitioned the Steelers to go back to using the old block style numbers. I could’ve sworn the lady that started it made an “appearance” on this here website at one point or another??? Ginny??? Block number lady? Zober???? #5 – HA HA HA HA HA. I’m enjoying this one while I can. Which is basically until next Sunday. #2- I remember Random n’at. What a tool. I’m sure you could have helped him sell more of his junk than he did otherwise. #5- How many Bieber wigs are we gonna see in the stands on Sunday? I have decided that every time you mention how hot Gina is to pretend you’re talking about me. @#3, Yeah I was here then and I remember the post re his asking you to stop using his trademarked self sticking thingy. Although it has become a ‘Burgh identity thing ( think OBX ), I saw two while driving to LA and another in LA. But then so has the one I now have on the rear window of my car. Only mine say ” Jag Off ” ! Trademark that, Mo Fo ! The Eat N Park girl is a cutie. So is Brandi Engel, the Mattress World girl. #6 As a Steelers fan-tastic and a college rugby player, I encourage all of you to participate in the Pittsburgh Rugby Football Club’s raffle. Making it to the National Tournament is an enormous achievement, but unfortunately an expensive honor to have. Gina has too much clothing on.